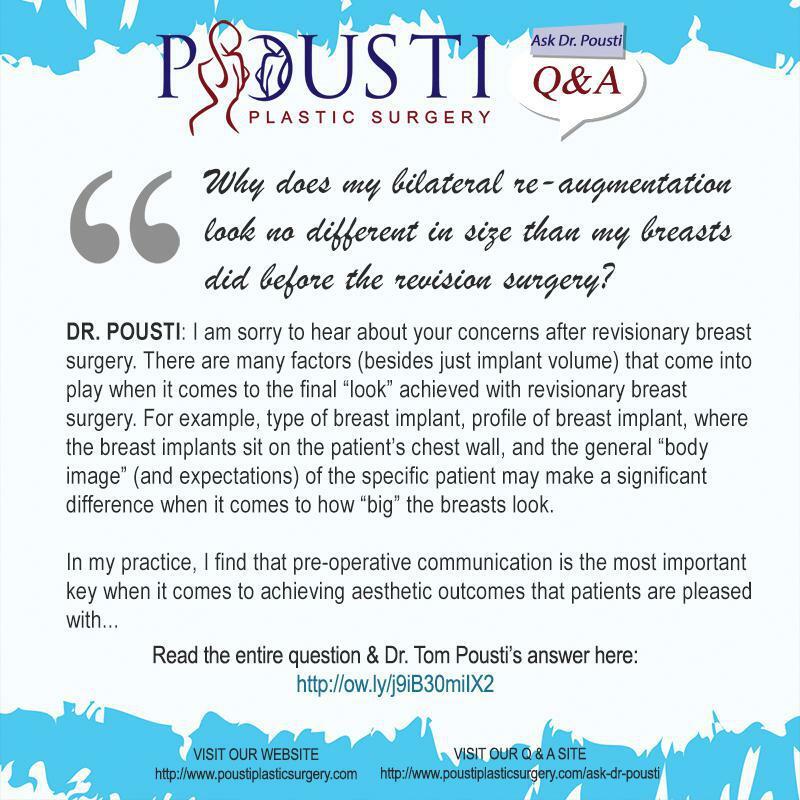 Pousti Plastic Surgery Blog Q&A: WHY DOES MY BILATERAL RE-AUGMENTATION LOOK NO DIFFERENT IN SIZE THAN MY BREASTS DID BEFORE? 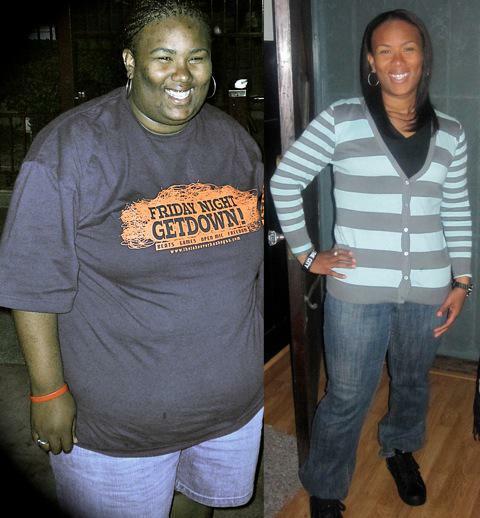 "The first time I had 286 Natrelle Classic 15’s. For the revision, I got 375 Natrelle Inspiras (moderate). When comparing the two, the 375 seemed a good deal larger, so I was expecting to see a noticeable difference. Coming out of surgery, I cannot even tell I had a revision done. I was told I should be close to the final look right away due to the pocket already being there. I took photos before, and compared them to after pics. 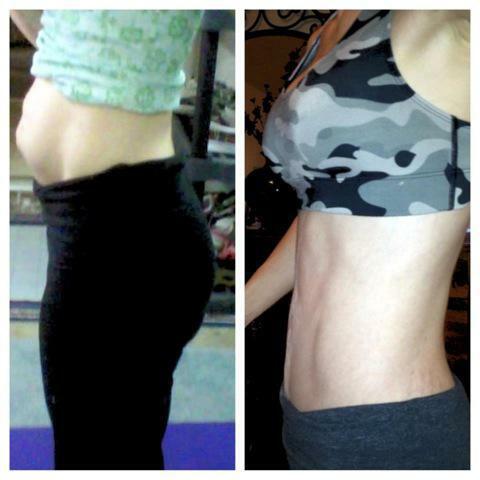 They look identical or even smaller – how is this possible?" DR. POUSTI: I am sorry to hear about your concerns after revisionary breast surgery. There are many factors (besides just implant volume) that come into play when it comes to the final “look” achieved with revisionary breast surgery. For example, type of breast implant, profile of breast implant, where the breast implants sit on the patient’s chest wall, and the general “body image” ( and expectations) of the specific patient may make a significant difference when it comes to how “big” the breasts look. In my practice, I find that pre-operative communication is the most important key when it comes to achieving aesthetic outcomes that patients are pleased with. I ask patients to avoid using potentially subjective terminology such as “C or D cup”, “natural or fake look”, “significantly bigger”, “1 cup size larger”, “a good deal larger”… On the other hand, the use of goal photographs and computer imaging (when possible) may be very helpful. I evaluate all of the patient’s “visual aids” that the patient is using to make sure that she is consistent; otherwise fine-tuning of the patient’s goals is necessary, prior to proceeding. The use of the visual aids also allow for discussion of realistic expectations; for example, there are times when a patient’s anatomic starting point limits her ability to achieve her desired outcome safely. If you continue to have significant concerns regarding breast size, re-augmentation will likely be an option down the line.